Reserve A Lovers Retreat Today! Perfect for a couple. Love the fireplace in the middle. Can’t wait to come back. Check-in/out was super easy & convienent. We had a great time!!! Staff were awesome!!!! Really enjoyed our cabin. We will book again in the future!!! The cabin was clean nice and had everything we needed in it!! Definitely planning our next trip very soon!! Everything was perfect this was our 3rd time going through Cabins USA and we will continue. Only thing that we weren’t happy with was the bed, we stayed 8 nights and we didn’t have a good night sleep not once, and we wanted to sleep late in the mornings but couldn’t for one because the bed was so hard And for two they didn’t have curtains in the cabin at all so all the light came in. But other than that it was perfect. Our stay with Cabins USA was perfect. Our cabin was exceptionally clean and was decorated very simple but welcoming. The express check in saved us a lot of time and made it easy for us to get to our cabin on our time. We cannot wait to come back to TN and when we book again it will always be with Cabins USA. We loved the cabin and the location, just had issues with the toilet running nonstop and the ceiling fans could not be adjusted, they were either on full blast or off. I would recommend getting those things looked at but we were satisfied overall. Property was nice. A little hard to get too. Cabin was clean, bed was comfy, secluded back deck with the hot tub. Hot tub didn’t get real hot. Had two TVs but only one cable box so you could only watch one channel on either TV at one time. We had a nice weekend and we would use cabins USA again as we have used them in the past. The bed needs a new mattress. The cabin could be cleaned better. Just a few little things to tidy up. A bit dirty. Spider webs in bathroom. Mold on ceiling. Awesome place to stay. Quiet from street. Great location. Comfortable!!! Fireplace was out of service. Microwave half worked. Not much parking. Besides these few problems the place was nice great location. overall everything was great. but the fire place did not work. two lights did not work and there was a black substance on the ceiling that look like mold. We enjoyed it very very much . And the one little problem that came up was taken care of very quickly. I can say with out a doubt that we would recommend this to any and everyone. And when we plan our next trip we will definitely be calling. Once again thank you so very much for the wonderful hospitality and making mine and my wife’s wedding weekend one we will remember for the rest of our lives. Biggest issue was the broken ;plugs behind the headboard of the bed. These are and fire/shock hazard that needs to be addressed ASAP. Other than that, small issue with dirty walls that can me wiped down now and then. The property was smaller than we are used to, but that turned out to be nice, the AC / Heat heated and cooled the property easily with no hot or cold spots like you normally find on split level cabins. Prefer to have off road parking, but that is no fault of the property, just because of the location. Will be back in May, not to this cabin but definitely with Cabins USA. 10 years going and 17 trips all with Cabins USA with little to no issues. Thanks for another great stay. Look forward to staying with y'all again. The stay was great. Just a heads up, the chair is still broken on the back and also a good dusting would have made it better. Upgrade the classic tv. But once again the stay was GREAT....I WILL BE BACK!!!!!!!!!!!! The kitchen table and chairs are wobbly and uncomfortable. Also if it would have been nice enough to sit on the back porch there was a broken chair there too. Overall loved the cabin. Thank you for taking the time to let us know about your recent stay in A Lovers Retreat! We here at Cabins USA work hard to ensure each of our guests have the best stay possible while vacationing in the Smokies. Thank you for letting us know about the kitchen table and chairs. Your comments have been forwarded to our maintenance department to be addressed. When you are ready to stay with us again, please mention you are a return guest for an additional discount. Thank you again for your review and thank you for choosing Cabins USA! The cabin was in the perfect location,and just big enough to fit my husband and my needs. However there where some things that I noticed. The cleaning crew can do a better job, there was cob webs everywhere and dust and dirt on the baseboards in the bathroom. The jacuzzi tub when we filled it up with water, there was dirt floating on top. The bed was very comfortable, however the pillows could have been a little better. The cabin itself was awesome, the cook wear was very nice the decor. The fireplace was the highlight of the cabin for us we used it very frequently during our stay. I would recommend this place for a couples weekend getaway or a full week stay. I felt very comfortable there and it was in a prime location in pigeon forge. We absolutely loved our cabin and its location. It's absolutely beautiful but it definitely needs some TLC. The cabin was very dusty with spider webs on the walls and curtains. Definitely needs a new flat screen tv on the bedroom side. Besides that we throughly enjoyed our weekend getaway. Cannot wait to come again! I loved this cabin! It was beautiful and clean. We had everything we needed. The bathroom walls were a little webby and stained but I had to look really hard to notice it. The jacuzzi was wonderful and heated well (and clean), the walls added an extra bonus for privacy. The only downside was that we did not have a driveway and had to awkwardly park on the street and the grill was very low quality in my opinion (but we werent planning on using it, its just good to know if you plan on grilling outdoors). Overall, I had the most relaxing vacation here than I have had in very long time. We are definitely coming back and I am certainly recommending Cabins USA! I am so happy to hear that you enjoyed your stay in A Lover's Retreat! We here at Cabins USA work hard to make sure each of our guests have the same great stay you enjoyed while vacationing in the Smokies. When you are ready to stay with us again, please mention you are a return guest for an additional discount. Thank you again for your review and thank you for choosing Cabins USA! A Lovers Retreat was a perfect cabin for our 20th Anniversary. It was minutes from Pigeon Forge but still felt like the perfect little cabin in the woods. Cabins USA never disappoint. Thank you for all of your kind words! We here at Cabins USA work hard to make sure each of our guests have the same great stay you enjoyed while vacationing in the Smokies. Thank you again for your review and thank you for choosing Cabins USA! The only problem we had was we found ants in our doughnuts. They were little tiny ants in the kitchen area. Thank you for taking the time to let us know about your recent stay in A Lovers Retreat! We here at Cabins USA work hard to make sure each of our guests have the best stay possible while vacationing in the Smokies. I apologize for the issues you experienced with ants. Maintenance has been notified and will be correcting that issue. When you are ready to stay with you again, please mention you are a return guest for an additional discount. Thank you again for your review and thank you for choosing Cabins USA! Great cabin that was close to Dollywood and still quiet and relaxing. Can`t wait till we come back. Thank you for all of your kind words! We here at Cabins USA work hard to make sure each of our guests have the best stay possible while vacationing in the Smokies. When you are ready to stay with us again, please mention you are a return guest for an additional discount. Thank you again for your review and thank you for choosing Cabins USA! Cabin was clean and nice. Needed some upkeep on the property. Stairs to cabin could be replaced. Peice of metal sticking out of ground unsafe. Chairs on back deck were broken. Bathroom was full of ants. Our paperwork said check in 3pm but couldn't check in till 4 according to office. Great location. Overall nice place to stay. We really liked this cabin. The lay-out was very handy and efficient, and the decor was in very good taste. It was well-stocked with the basic items, and everything within normal reach was pretty clean (The rafters, ceilings, and other extremely high areas were in need of dusting) There are only a few things I would want to change before staying here again. One would be the inclusion of TV channel lists and another would be instructions regarding the use of the TV remote controls. The most important change needed would definitely be installing better window blinds. The morning sun comes in the Windows neaest the bed, which makes it impossible to sleep much past sun-up. (I don't know about other people, but one of the reasons we like cabins better than hotels is the privacy and ability to sleep in without being disturbed.) Overall, though, we would recommend this cabin for a couple. We were well pleased with everything and will be coming back to the same place and use Cabins USA for sure. Very close to the main part of Pigeon Forge too, very convenient and very quiet. You can't go wrong with this getaway. Thank you for all of your kind words! We here at Cabins USA work hard to make sure each of our guests have the best stay possible. When you are ready to stay with us again, please mention you are a return guest for an additional discount. Thank you for choosing Cabins USA and we look forward to having you as our guest again! We were thrilled with our accommodations and location of the cabin!! Everything was very clean and so close to the strip and not far from Cades Cove or Gatlingurg!! We will definitely be using them again and often!! You should get your cabin through them!! Great prices and easy booking/checking out processes! Thank you for all of your kind words! When you are ready to stay with us again, please mention you are a return guest for an additional discount. Thank you for choosing Cabins USA and we look forward to having you as our guest again! Nice lil cozy cabin! Only things that bothered us were when we first walked in it smelled awful from the oven being auto cleaned. Also the twin sheets for the pullout couch were dirty and had popcorn pieces throughout them. Other than that we enjoyed our stay and the location was great! My husband and I were celebrating our 10th anniversary. We had a great time and enjoyed the cabin very much. The only concern we had was the cabin was very dusty and had several cob webs throughout the cabin. Other than that the remainder of the cabin was great and we enjoyed ourselves very much. If you plan to visit in the winter months, I would highly recommend 4 wheel drive. This cabin is located in the mountain and our 4-cycl car struggled with some of the turns. Thank you for choosing Cabins USA to celebrate such a special occasion and I am happy to hear that you enjoyed your stay in A Lovers Retreat. We work hard to make sure that each of our guests have the same great stay you enjoyed while vacationing in the Smokies. I apologize for the cleanliness issues you experienced during your stay. Your comments have been forwarded onto our housekeepers and inspectors so they can make sure each of our cabins are being cleaned to our standards. When you are ready to stay with us again, please mention you are a return guest for an additional discount. Thank you again for your review and thank you for choosing Cabins USA! Stayed with cabins USA before and had nothing but positive experiences. This time was still Pleasant but we had some trouble reserving our cabin and getting our check-in code on time. But it was quickly fixed. Finding the cabin was a little difficult. But when we did it was well Worth it. It was a little bit messy inside when we got there, but nothing that would keep me from going back. We've stayed at this property before so we had an idea what to expect. We arrived to find that the internet/wifi didn't work, the land line phone was dead and the remote would not turn the TV on on the living room side. We communicated to the staff these issues. The phone is no longer active (by cabin owners request). Staff came the following day and fixed the WIFI and we turned on the TV manually (not a big deal on that one). The one thing that bothered us some was that the cabin was not dusted very well at all. Found stuff on the coffee table and other places. They had installed new locks on the front door since the last time we stayed and it was a pain to lock the door properly. You have to hold the door knob in all the way and move the door just to the correct spot to lock the dead bolt (part of the new digital door lock system). My wife had thought she had locked it one evening when in fact the deadbolt was not engaged into the door frame. Water in shower goes from hot to cold and back pretty quickly when taking a shower. My wife reminded me we had that was an issue the first time we stayed there. Over all we had a a good time. We've used CABINS USA several times and like them pretty well, but we will probably try another cabin next time. I loved our cabin! It was very beautiful and loved everything about it. It's located in an area that isn't far away from the main road which was a plus! We truly enjoyed our stay. The only thing we would recommend is that it needs a bigger TV and a more comfortable bed. Other than that we was pleased with it all. Thank you for such a great review. We will contact the owner of A Lovers Retreat with the suggestions of the TV and Bed. Thank you for again for choosing CabinsUSA. You need to seriously take a look at the possibility of having a key pad entrance for the backdoor. We had our 2yr old grandson with us that went into the cabin and locked the door handle lock while we were in the hot tub. There was about an 8 foot drop off the deck to the ground to go around to the front door to use the key pad to get in the cabin. Other wise we had a great time in the cabin. The cabin was great and we really enjoyed our night there. Only complaints we had is the bed could have been a little more comfortable, Also the old T.V. with the built in VCR was out of place. either up date it or get a new one. We would definitely come back again. The booking staff was really great and helpful. Thank you for taking the time to review your stay with us. We appreciate all your feedback. We are glad that you enjoyed your stay and we hope that we will see you again soon. The cabin was great. It was perfect for my wife and I. The open floor plan was different, but we enjoyed it. The reason the comfort got such a low review was because of the mattress on the bed. It was horrible. It was sagged in the middle. Laying across the bed, you would roll into the center. We wound up sleeping cross ways in the bed to make it more comfortable. We told the staff when we checked out about it. Hopefully they have got it fixed for others. If the mattress was good, it would have got all 10's and I would recommend the property. If the mattress is replaced, this is a great cabin for a couple to stay in. I'd stay here again next year as long as it has a new mattress. Thank you for your review. Cabins USA prides ourselves on having high quality cabins that come well cleaned and maintained. We take our customers thoughts and feelings seriously and will always strive to improve their experience. We appreciate your feedback, and we hope we hear back from you again soon. The cabin is very nice & cozy & perfect for a couple. However there are a few drawbacks to our stay. Loved the Hot Tub! but the view from the hot tub is just looking at a cement wall & tree stumps. The bed wasn't very comfortable. Could use an updated mattress. Regarding the kitchen table & chairs, the one chair was crooked leaning forward kinda dumping you out of your seat if you didn't carefully sit. The shower floor didn't seem stable. It made a noise every time you made a move. The floor of the shower might not be on the cabin floor too well. Although there were those couple of drawbacks, we enjoyed our cabin. I loved having a cabin instead of a motel room. Very homey for this country girl. :-) It was a last minute decision for this vacation so thankful to get a cabin for the week but I hope the next time to find a cabin a little bit more secluded with a little better view. CabinsUSA employees were very nice & helpful even as we checked in after driving all day right before they closed. Overall the experience was good. I would come back to them. Only cause I want a mountain view that I would chose another cabin. Loved my vacation. We absolutely loved the cabin, just one thing...in the picture it shows the cabin in an area all by itself and the cabins are nothing like that. There are cabins right next to each other. No space like I thought in the grounds area to go outside and hang out. But the inside of the cabin was cute and cozy. Thank you for your review. We are delighted that you had a great stay with us. We apologize if you were inconvenience regarding the location of the cabin. We do highly recommend our guest to call and make reservations over the phone, so that we can insure you know your cabins amenities, locations, and surroundings. We hope that we hear from you again soon. The cabin was wonderful, and we enjoyed it very much, but you have to get the lock situation taken care of. Never should you install something so important as that, and not be sure that they are functional, and not have your staff fully trained. It was VERY frustrating that EVERY time we left, we had issues with the door. We were there three days, and we had to have maintenance people there three times. Also, you have an issue with customer service. All but one of the people we talked with were very nice, but that one sure put a damper on our stay. Otherwise all was good, except you need to update your pictures of the cabins, as they make it appear that the cabins are further apart than they are, and it is quite shocking to arrive and find that they are VERY close together. Everything was great except for the mattress, it was very hard and uncomfortable. Thank you for choosing Cabins USA. We apologize if you were uncomfortable or inconvenienced during your stay. I will have the mattress inspected immediately. We hope that we will hear from you again soon. My husband and I chose to book and stay at A Lovers Retreat, with Cabins USA, for our 19th wedding anniversary. We could'nt have been more pleased! It was very private and cozy and just perfect for our occasion. Will definitely be staying again! Just a few thing that need to be checked out. We had problems the first night with the smoke detector, maintenance came out Wed. and Thurs. to replace the battery, still when we came in Thurs. night it was still beeping, call and the man said he wasn't coming out for that and we could take the battery out, they came fix it on Friday. Two and a half nights of beeping over the bed, not fun. The chairs to the table need to be glued, they were real shaky. My wife and I celebrated our 25th wedding anniversary and it was great! We definitely want to stay in the CabinsUSA again. The cabin was so very nice and cozy. This cabin had every thing we could think of and we loved the setup! We were not ready to leave! Our only complaint was that when we checked in the comforter on the bed was stained and dirty. Other than that we had an amazing time. The cabin itself was great! This was our 3rd stay in Pigeon Forge with Cabins USA and we will be back for sure. This cabin was a little closer to others than we normally like but the cabin was very nice and the hot tub was the cleanest we've seen. We will be back next year. Overall a nice stay. Could have been a little cleaner but not too bad. Wish I had took my own bed clothes. The ones on the bed we're clean but we'll worn to say the least. I will use Cabins USA agin. We absolutely loved our cabin for our honeymoon! It was wonderful! The staffing was great, and the cabin was clean and well stocked! We can't wait to come back again, hopefully for our first year anniversary! We had a great stay with Cabins USA. The cabin was constructed of good quality and in excellent shape. The property had all the perks and amenities that we desired. 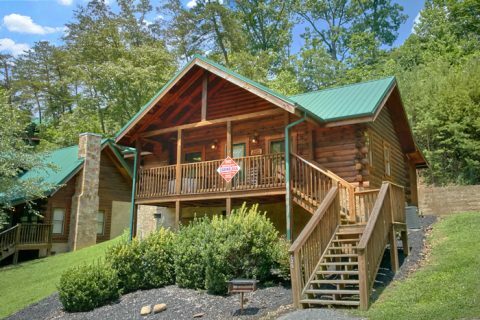 I would highly recommend Cabins USA to other vacationers interested in traveling to the Pigeon Forge/Sevierville area. there was not enough silverware or plates provided. check in and check out was easy and fast. The only complaint that I have is that when we arrived, the hot tub was not working. It was not fixed until the next afternoon. Also, there was a problem with the volume or sound in the living room. It was soo annoying that we couldn't really utilize that area of the cabin. I feel that the ammenities should have been checked for maintenance prior to our arrival. Everything should have been in working order. Enjoy our stay. View was lovely, location great. This was our first stay with Cabins USA and I was very impressed with our cabin. My father has stayed in several of these cabins while vacationing and he recommended we stay. We loved it. The property was nicely kept and the cabin was clean and spacious. The booking was easy and flawless. I received my booking information in the mail the next week. At check in the staff was friendly and the payment process was fast and easy. The only minor issues were the televisions were a little outdated and were starting to malfunction. This particular cabin worked very well for us because we had an 18 month old with us and this allowed us to be in two different areas at once. All in all it was great place to stay. I will definitely be staying again and I have recommended Cabins USA to friends and family. The cabin was so nice the decor was romantic very clean private we can not wait to come back again, it was more than what we expected, and the staff was great,oh yes we will be back! October 19th! We really enjoyed the cabin and the service that we received from Cabins USA. The chairs on the back deck were broken. The bathroom floor was not clean. There were no ice trays in the refrigerator, which would have been helpful. Overall, had a great stay. All in all a great experience! We will be back! Enjoyed the cabin and its location. Will be back soon I hope. the cabin needs to be inspected from a cleaning stand point. dishes that were clean were still in dishwasher. other than that great.